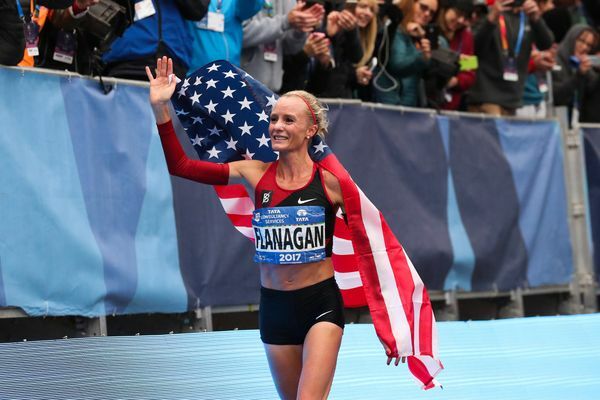 Shalane Flanagan will return to the scene of her greatest triumph this weekend when taking to the start line in Staten Island to defend her title at the New York City Marathon. 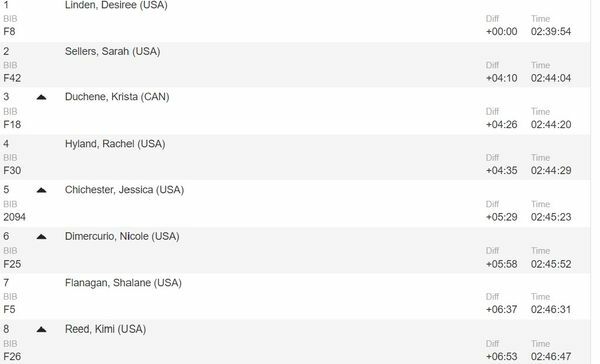 The Bowerman Track Club athlete has had a low-key year so far, coming home sixth in dire conditions at the Boston Marathon in April, the last race she completed. But the 37-year-old is confident of a stout title defence this weekend. In an interview with Runner’s World, Flanagan revealed she expects to be in contention with the leading elites, who include Vivian Cheruiyot, Mary Keitany and fellow American Des Linden. “I feel like I can take big risks this year. That’s the beauty of being the defending champion. I’ve already accomplished what I really wanted, so now I have the ability to really do whatever I want,” Flanagan said. “I don’t feel the panicky desperation to win—I am calm and calculated, but also willing to do big things. 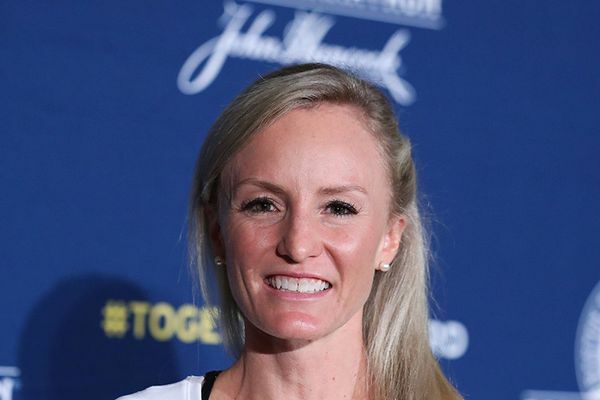 Shalane Flanagan is set to return to the scene of her greatest triumph by competing in this year’s New York City Marathon. The 37-year-old will line up in the Big Apple on November 4 ready to take on the world’s best once again. “When I think about running New York, I get a feeling of ecstasy; my stomach turns,” she told the New York Times. “It’s like if you’re dating someone and it goes well and you want more. 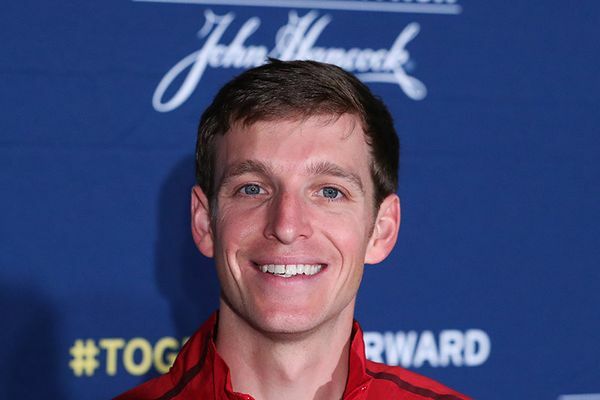 On what proved a gruelling day for all competitors, Kimbia athletes Andrew Bumbalough and Shalane Flanagan battled to strong performances at the Boston Marathon today, Bumbalough turning in a superb performance to finish fifth in 2:19:52, less than four minutes behind race winner Yuki Kawauchi and just over a minute off a podium finish. 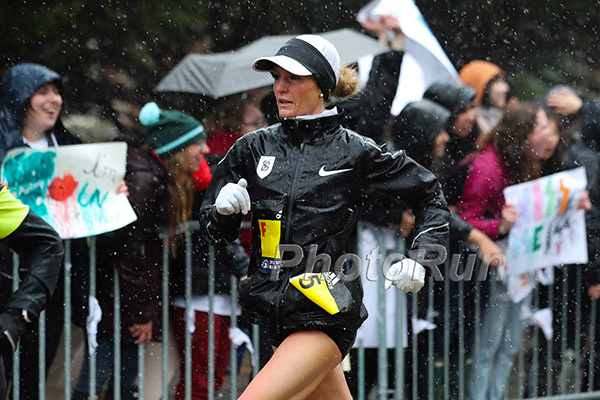 Flanagan, meanwhile, endured a rough time in the conditions, with freezing temperatures, driving rain and a constant headwind hammering the runners throughout. In a race won by fellow American Desi Linden in 2:39:54, Flanagan battled to seventh place in 2:46:31. “It was basically the nastiest conditions you could imagine running in,” said Bumbalough. “I made the decision early not to go with the lead group, it just felt a little quick for the day and we had a nice solid group of guys that stayed together for a long time. I’m really happy with the decision I made to run a pace I knew I could run for the day and see what that got me. I never anticipated how much the front group would blow up but I made the exact decision I wanted to. It was Bumbalough’s first time cracking the top five at a major marathon. “Fifth place is great, I beat dudes I had no business beating,” he said. In the women’s race, reigning New York City Marathon champion Shalane Flanagan endured a tough day at the office, the Marblehead native forced to make a quick pitstop early in the race to use the portable bathroom. She soon rejoined the lead pack, but when the field began to splinter in the latter of the race, Flanagan was soon detached. Nonetheless, on a day where more than half of the elite fields failed to finish, Flanagan drew on all her resolve to reach the finish at Boylston Street. 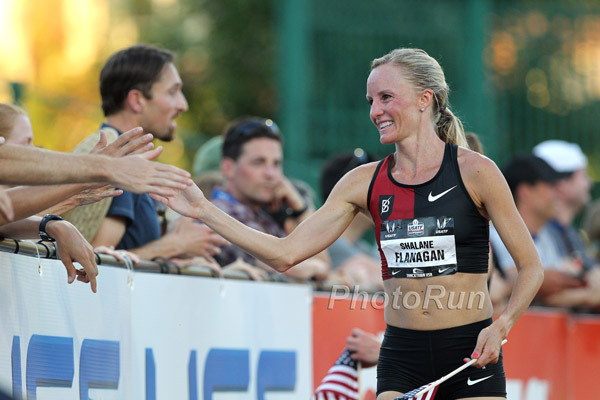 Shalane Flanagan had another impressive showing at the UW Invitational in Seattle, Washington on Saturday afternoon, the 36-year clocking a season’s best of 8:43.28 to finish second in the women’s 3000m behind Dutch middle distance star Sifan Hassan, the reigning world indoor 1500m champion. Flanagan has recently begun preparations for the Boston Marathon in April, where she will seek to win her first title at the race to add to her historic victory in New York last November. 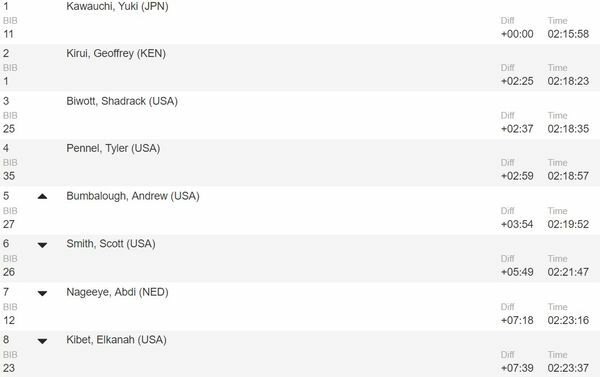 A fortnight ago she opened her 2018 campaign with an 8:55.11 clocking for 3000m to win in Seattle, and today she carved 12 seconds off that time, something that will leave the Bowerman Track Club athlete high on confidence as she returns to heavy mileage ahead of Boston. 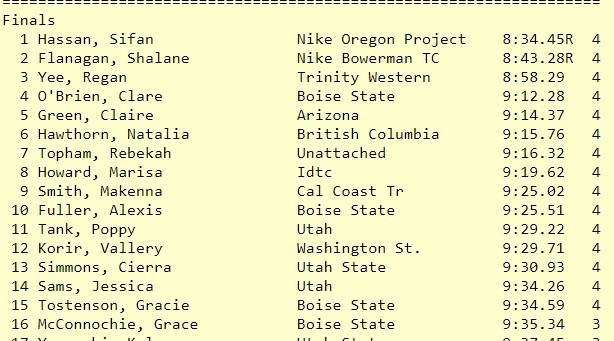 Both Hassan’s time of 8:34.45 and Flanagan’s were under the previous meeting record. 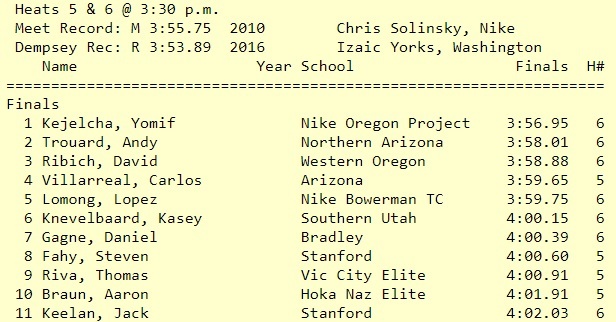 Also in action in Seattle was Lopez Lomong, who finished fifth in the men’s mile in 3:59.75. That carved more than four seconds off his previous season’s best, which he ran in Seattle in his opener a fortnight ago.